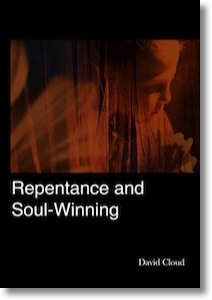 This is an in-depth study on biblical repentance and a timely warning about unscriptural methods of presenting the gospel. The opening chapter, entitled “Fundamental Baptists and Quick Prayerism: A Faulty Method of Evangelism Has Produced a Change in the Doctrine of Repentance,” traces the change in the doctrine of repentance among fundamental Baptists during the past 50 years. Chapter Three looks at four “Unscriptural Presentations of Repentance”: (1) An Easy Prayerism Presentation: Failing to deal plainly with repentance. (2) An Insufficient Presentation: Failing to define the terms of the Gospel so the hearers plainly understand, and failing to contrast the true Gospel with false gospels. (3) A Positive Presentation: Failing to lay a proper foundation of the holiness of God and the sinfulness of man. (4) A Need-Oriented Presentation: Failing to make a distinction between genuine salvation and mere reformation and ritual. Chapter Four is titled “Does Salvation Make a Difference,” demonstrating that profession without a corresponding change of life is not biblical salvation. Chapter Five, “Pentecost vs. Hylescost,” contrasts Jack Hyles evangelistic methodology with the Bible. Chapter Six answers questions that commonly arise pertaining to this subject, including “Are you preaching lordship salvation?” and “Isn’t your definition of repentance a works salvation?” (The former title of this book was “Repentance Is More Than a Sinner’s Prayer”) 2006 edition.